Following “Phantom of the Opera” and “Aida” of last year, the performing arts scene is seeing the arrival of heavyweight openers for the 2013 season. Among them is major musical company EMK’s much-anticipated imported musical “Rebecca,” which opened at LG Arts Center on Friday. Following “Rebecca,” one of the most anticipated homegrown musicals, “The Goddess is Watching,” is opening at Chungmu Art Hall on Tuesday in Seoul. “Rebecca” is based on Daphne Du Maurier’s 1938 novel of the same title. The German-language musical is being staged as a Korean adaptation, starring some of the nation’s top musical actors and actresses, including Ok Ju-hyun, Oh Man-seok, Ryu Jung-han and Shin Young-sook. 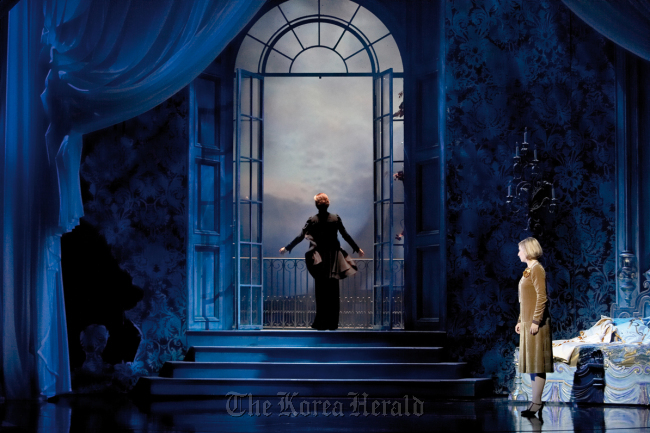 The musical is written by Michael Kunze and Sylvester Levay, who also wrote the musicals “Elisabeth” and “Mozart!” ― both of which enjoyed much popularity in Korea last year. The original novel was also made into a film in 1940 by Alfred Hitchcock, the English director’s first American project of his career. The gothic thriller is about an aristocratic widower named Maxim de Winter and his memory of his dead wife, which keeps haunting him and his new bride. The role of Maxim is being shared by three different actors: TV and musical actor Yoo Jun-sang, musical actor Ryu Jung-han, and musical and film actor Oh Man-seok. Among them, Yoo enjoyed much popularity for his role as a loving husband and medical doctor in last year’s KBS hit drama series “My Husband Got a Family.” Though he is largely known as a TV actor, Yoo in fact made his musical debut back in 1998 in “Greece.” He is returning to the theatrical stage after starring in “The Three Musketeers” in 2011. Oh Man-seok, best known for his performance as the East German transgendered singer in “Hedwig and the Angry Inch,” is also sharing the role of the rich widower. Prominent musical actress Ok Ju-hyun (“Elisabeth,” “Aida”) and Shin Young-sook (“Rudolf,” “Mozart!”) are sharing the role of Mrs. Danvers, an obsessive housekeeper who served Maxim and his late wife before she died. According to a survey by PlayDB, a prominent performing arts website, “The Goddess is Watching” has been chosen as the most anticipated homegrown musical of the year 2013. The show takes place on a remote island during the Korean War. It tells the story of six different soldiers, some belonging to the North Korean army, who end up living together on the uninhabited island after a shipwreck. 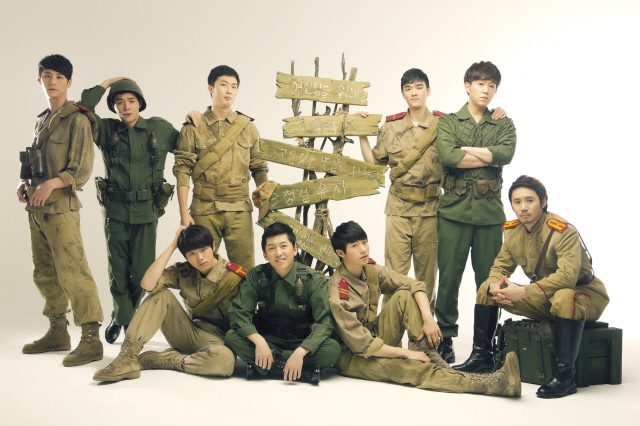 The plot of the show develops as a soldier named Soon-ho, the only member of the group who knows how to fix the ship, suffers from severe PTSD after witnessing his brother’s death in a battle. Another member of the group named Young-beom creates a story of a beautiful goddess to console Soon-ho and ease his fragile condition. “The Goddess is Watching” also received funds from CJ Creative Minds, a funding program of CJ Culture Foundation that supports up-and-coming musical writers and producers. “Rebecca” runs until March 31 at LG Art Center in Yeoksam-dong, southern Seoul. Tickets range from 50,000 won to 130,000 won. For more information, call 1544-1555. “The Goddess is Watching” runs until March 10 at Chungmu Art Hall in central Seoul. For tickets and information, call (02) 744-7090.